President Muhammadu Buhari, yesterday, signed an Executive Order No. 6 of 2018 on the Preservation of Assets Connected with Serious Corruption and other relevant offences. The Executive Order No. 6 of 2018 is to restrict dealings in suspicious assets subject to investigation or inquiry bordering on corruption in order to preserve such assets from dissipation, and to deprive alleged criminals of the proceeds of their illicit activities which can otherwise be employed to allure, pervert and/or intimidate the investigative and judicial processes or for acts of terrorism, financing of terrorism, kidnapping, sponsorship of ethnic or religious violence, economic sabotage and cases of economic and financial crimes, including acts contributing to the economic adversity of the Federal Republic of Nigeria and against the overall interest of justice and the welfare of the Nigerian state. 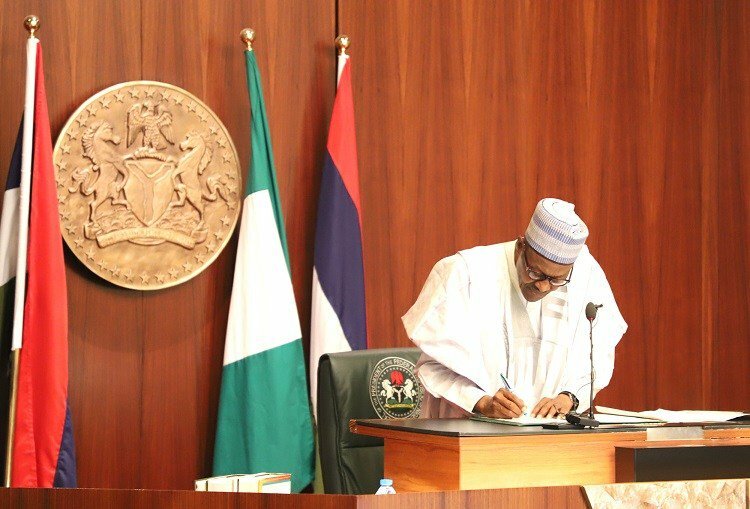 Buhari described the signing of the bill as another milestone in the fight against corruption, a project he said was crucial to the viability and continuous well-being of the country. While noting that his administration has kept its promises to fight corruption, tackle insecurity and revamp the economy, he assured it will remain committed until Nigeria triumph over the evil of corruption, attain a prosperous economic status and surmounts all her security challenges. President Buhari said it had become necessary to rekit and re-tool the administration’s arsenal to be able to effectively tackle corruption’s perilous counter-attack against the Nigerian state. He added that the Federal Government, in line with its anti-corruption strategy, would seek to ensure that the ends of justice is not defeated or compromised by persons involved in a case or complaint of corruption. Buhari noted that while there were many reasons Nigeria has been struggling, the most unfortunate cause of great disparity between Nigeria’s wealth and its poverty is endemic corruption. is everywhere; at all levels of government, and every stratum of our society. Without doubt, corruption constitutes an unusual and extraordinary threat to the well-being, national security, and economy of Nigeria. “Mindful of this serious challenge, as you are all aware, before coming into government, this administration specifically promised Nigerians that it will address the challenges facing our nation in the three areas of (a) Security, (b) Economy and (c) Corruption. “As a government, and in furtherance of our anti-corruption programme, we have since inception engaged in multi-sectoral reforms on anti-corruption including the enforcement of Treasury Single Account (TSA), strict implementation of the Bank Verification Number policy, signing of the Open Government Partnership, and a lot of efforts have gone into building and development of our anti-corruption institutions among others. “We have so far kept faith with our promise and shall remain committed thereto until Nigeria triumphs over the evil of corruption, attain a prosperous economic status and surmounts all her security challenges. “Like I have many times said, if Nigeria does not kill corruption, corruption will sooner or later kill Nigeria. Therefore, after three years in office, it is an opportune time to further review our achievements against set goals, and where necessary; reappraise our strategy in order to achieve our outstanding objectives. Any individual or business institution etc. which collaborates with fulani fraudulent criminal sultanate political government with its emirates under the dead fraudulent political name Nigeria to steal this territory natives wealth or to disrupt this territory natives business etc., must pay the damages and the price to the full. This is Disintegrated Republics of the natives which must be defended with the Sword in this final conquest of the Liberation Revolutionary Warfare of the natives which ends in Sokoto- the sit of the satan of this natives territory. God given Victory is the natives. Only the Sword decides. God Is With Us!! !